YANGON, Myanmar – A U.N. official on Saturday warned against prematurely resettling parts of Myanmar destroyed by a cyclone and human rights groups lashed out at the country’s military leaders for evicting storm refugees from relief camps. Hundreds, if not thousands, of displaced people also have been expelled from schools, monasteries and public buildings, Human Rights Watch said in a release Saturday. 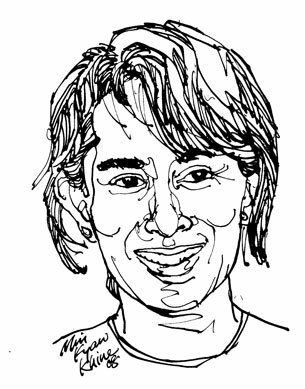 In the nation’s biggest city, Yangon, there were eyewitness reports of one such eviction from a Christian church. Another group, Refugees International, said authorities appeared to be trying to get villagers back to their land to begin tending their fields and reviving agriculture. “While agriculture recovery is indeed vital, forcing people home without aid makes it harder for aid agencies to reach them with assistance,” it said. Anupama Rao Singh, regional director of the United Nations Children’s Fund who visited the affected area recently warned Saturday against premature resettlement, even if it’s voluntary. She did not confirm that evictions had taken place. “Premature resettlements to the villages, even if it’s voluntary, will cause serious risks to the refugees,” she said. “Many of the villages remain inundated with water, making it difficult to rebuild. There is also a real risk that once they are resettled, they will be invisible to aid workers. Without support and continued service to those affected, there is a risk of a second wave of disease and devastation,” she added. An estimated 2.4 million people remain homeless and hungry from this month’s cyclone, which left at least 134,000 people dead or missing. Gates, speaking in Singapore, said the U.S. has not had problems helping other countries in natural disasters while still respecting their sovereignty. He said that the U.S. will continue to try to get aid in. U.S. ships off the coast of Myanmar are poised to leave because they have been blocked from delivering assistance to the ravaged country. Shortly after the cyclone struck, the U.S., France and Britain sent warships loaded with relief supplies, but the Myanmar regime has refused to let them land, apparently fearing a foreign invasion. Eight camps set up for homeless survivors in the Irrawaddy River delta town of Bogalay were “totally empty” as authorities continued to move people out of them, said Teh Tai Ring of UNICEF. After his statement was reported, UNICEF issued a statement saying the remarks referred to “unconfirmed reports by relief workers on the relocation of displaced people affected by” the May 2-3 storm. Separately, at a church in Yangon, more than 400 cyclone victims from a delta township, Labutta, were evicted Friday following orders from authorities a day earlier. “It was a scene of sadness, despair and pain,” said a church official at the Yangon Karen Baptist Home Missions in Yangon, speaking on condition of anonymity for fear of official reprisal. All the refuge seekers except some pregnant women, two young children and those with severe illnesses left the church in eleven trucks Friday morning. The authorities told church workers that the victims would first be taken to a government camp in Myaung Mya — a mostly undamaged town in the Irrawaddy delta — but it was not immediately clear when they would be resettled in their villages. Foreign aid experts disagree, arguing that many people still need of emergency assistance of food, shelter or medical care. “Our teams are still encountering people who have not seen any aid workers and still have not received any assistance. Some of the villages that are only accessible by foot are particularly vulnerable,” said the aid group Doctors Without Borders. YANGON, May 31 (Xinhua) — Chinese medics, who worked in Myanmar for the relief of cyclone victims, ended its two-week mission and left Yangon Saturday morning for home. The people have grown much closer to Myanmar’s Buddhist monks, who provide care, aid and solace, while their alienation from the military junta has grown. “Institutionalisation really is the last resort,” said Guy Cave, Save the Children’s Burma deputy country director. all 70 news articles . The United Nations says leaving people on the streets is unacceptable and has called for Burma to keep the centres open. Unicef’s regional director, Anupama Rao Singh, says the move risks creating a second wave of disease and disaster. By Andrew Gray Reuters SINGAPORE: Tens of thousands of people died because Myanmar’s government rejected offers of foreign aid for cyclone victims, US Defense Secretary Robert Gates said on Saturday. YANGON, Myanmar (AP) – Myanmar’s military government is forcing cyclone victims out of refugee camps and “dumping” them near their devastated villages with virtually no aid supplies, UN and church officials said Friday. By Tristan Stewart-Robertson A FLOATING clinic donated to the Burma cyclone relief effort by a Scottish businessman has seen its first birth. SINGAPORE (AP) – Defense Secretary Robert Gates says that Myanmar’s obstruction of international efforts to help cyclone victims has cost “tens of thousands of lives. Singapore’s Prime Minister Lee Hsien Loong says Burma’s response to foreign offers of emergency aid is ‘regrettable. The Pope made his indirect appeal in an address to the Catholic bishops of the former Burma, who are winding up a visit to the Vatican, and urged them to be strong in the face of “distress, persecution and famine”. There was the disaster of her fisherman son, drowned at sea in a storm that was never noticed outside Burma. There was the disaster of widowhood: her husband died six years ago of an illness to which Daw Aye cannot even put a name. The ruling generals of Myanmar try the world’s patience with their cruel indifference in the face of the country’s humanitarian crisis. America’s Defence Secretary Robert Gates says the delay by Burma’s junta in allowing international aid into the cyclone-hit country cost tens of thousands of lives. YANGON – Myanmar has asked Southeast Asian nations to coordinate the international cyclone relief effort, but regional officials here said Saturday they are frustrated by the regime’s handling of the crisis. PYINMAGON, Myanmar – Peering out from under the hood of his raincoat, the boat skipper squinted as he tried to steer his small wooden boat through the narrow, twisting channel leading to a village deep in Myanmar’s cyclone-ravaged Irrawaddy delta…..
YANGON, Myanmar – Myanmar’s military government is forcing cyclone victims out of refugee camps and “dumping” them near their devastated villages with virtually no aid supplies, U.N. and church officials said Friday. SINGAPORE – Myanmar’s obstruction of international efforts to help cyclone victims cost “tens of thousands of lives,” Defense Secretary Robert Gates said Saturday, reflecting the widespread frustration with the military government there. Fri May 30, 2:05 PM ETKYAUKTAN, Myanmar (Reuters) – Myanmar’s junta started evicting destitute families from government-run cyclone relief centers on Friday, apparently fearing the ‘tented villages’ might become permanent. GENEVA (Reuters) – The International labor Organisation warned on Friday of an increased risk Myanmar’s ruling military may try to use forced labor — including children — to rebuild the country after this month’s cyclone. The ILO has been at loggerheads with the former Burma for more than a decade over what the United Nations agency calls a widespread practice of forcing villagers to work on infrastructure projects or as porters for the army. It is also concerned about the recruitment of minors into military service in the secretive state whose ruling junta has been heavily criticized by the West for its reluctance to let in foreign aid workers following Cyclone Nargis, which struck on May 2 and left 134,000 people dead or missing. The ILO is working with Myanmar authorities to “ensure that the reconstruction effort does not involve the use of forced labor in any of its forms,” it said in a report on Friday. Steve Marshall, ILO’s liaison officer in Yangon, submitted the report to the annual International labor Conference, being held in Geneva through June 13. A key committee of ILO’s 182 member states will hold a debate on Myanmar on Saturday. “From the ILO’s perspective it is important to assist communities but the reconstruction work must be done in line with international standards,” Marshall told Reuters on Friday. Myanmar passed a decree in October 2000 abolishing forced labor, which is banned under an ILO Convention it has ratified. The Geneva-based agency was allowed to open an office there two years later to help it eradicate the practice. But the ILO said in its report some victims of forced labor were harassed or detained in the past year when they sought to report abuses. This had discouraged many others from coming forward and distorted official figures. Some 89 allegations of forced labor have been lodged under a complaints mechanism set up in February 2007, the report said. Six young labor activists, sentenced to between 20 and 28 years in jail last year for helping organise a May Day workers’ rights seminar, remain in prison, the ILO report said. YANGON, Myanmar – Myanmar’s military government is removing cyclone victims from refugee camps and dumping them near their devastated villages with virtually no aid supplies, the United Nations said Friday. In an aid agency meeting, the U.N. Children’s Fund said eight camps earlier set up by the government to receive homeless victims in the Irrawaddy delta town of Bogalay had emptied as the mass clear-out of victims was stepped up. Camps were also being closed in Labutta, another town in the delta, a low-lying area which took the brunt of Cyclone Nargis nearly a month ago. About 2.4 million are homeless and hungry after the May 2-3 cyclone hit Myanmar, also known as Burma. Centralizing the stricken people in the centers made it easier for aid agencies to deliver emergency relief since many villages in the delta can only be reached by boat or very rough roads. Aid workers who have reached some of the remote villages say little remains that could sustain their former residents: houses are destroyed, livestock has perished and food stocks have virtually run out. Medicines are nonexistent. The UNICEF official said that some of the refugees are “being given rations and then they are forced to move.” But others were being denied such aid because they had lost their government identity cards. There had been previous reports of forced removals, but on a scattered basis. In some cases, people were reportedly sent away ahead of visits by foreign dignitaries, and in others people were sent from schools that were to be used as voting places during a recent national referendum on a new constitution. People were also cleared out of some Buddhist temples where they had taken shelter, but in those cases apparently had been transferred to official refugee camps. Human rights and aid groups also complained Friday that Myanmar’s military government was still hindering the free flow of international help for victims. Some foreign aid staff were still waiting for permission to enter the Irrawaddy delta while the regime continues to review entry requests for 48 hours, the groups said. One foreign aid worker attending Friday’s meeting said that in practice it took at least four days to obtain permission from the Ministry of Social Welfare to travel to the delta. “The longer you want to stay, the longer it takes,” he said, declining to give his name for fear of government reprisals. “The Burmese government is still using red tape to obstruct some relief efforts when it should accept all aid immediately and unconditionally,” the U.S.-based Human Rights Watch said in a statement. The International Red Cross was waiting for permission to send 30 of its foreign staffers into the delta. 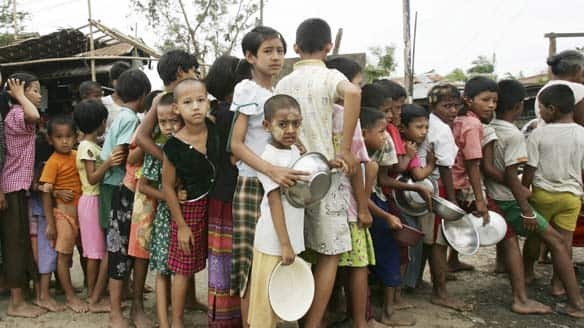 The regime has also barred naval vessels from the United States, France and Great Britain from entering Myanmar’s waters, leaving them to wait offshore with their loads of humanitarian supplies. The French have been forced to dock in Thailand and turn over the relief goods to the United Nations for onward shipment into Myanmar. “By still delaying and hampering aid efforts … the generals are showing that, even during a disaster, oppression rules,” Human Rights Watch said. While welcoming millions of dollars from the international community for cyclone relief, Myanmar lashed out at donors for not pledging enough. State-run media decried donors on Thursday for only pledging up to $150 million — a far cry from the $11 billion the junta said it needed to rebuild. The isolationist government agreed to allow foreign aid workers in after U.N. Secretary-General Ban Ki-moon met with leader Senior Gen. Than Shwe last weekend. But delays continue, Human Rights Watch said. Myanmar’s government says the cyclone killed 78,000 people and left another 56,000 missing. The country’s xenophobic leaders are leery of foreign aid workers and international agencies, worrying they could weaken the junta’s powerful grip. The generals also don’t want their people to see aid coming directly from countries like the U.S., which the regime has long treated as a hostile power. In Singapore on Friday, Sen. Joseph Lieberman said regional superpowers India and China should exert their influence over Myanmar’s military junta to push it toward democracy. Lieberman, who is in Singapore to attend a security conference, said he and other senators have met with the ambassadors of the two countries in Washington to convey this message.